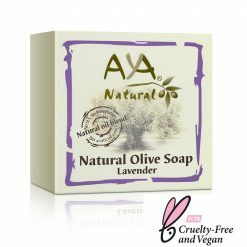 Natural olive oil soap – lavender is non-GMO and is accredited with the cruelty free PETA seal of approval. It is perfect for skin that is itchy, dry, irritated, sensitive, flaky and/or cracked. It does not leave any oily residue, nor does it dry your skin. 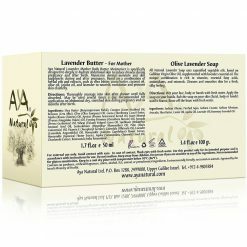 Natural olive oil soap – lavender is designed to give you relief from the following symptoms; skin that is itchy, dry, irritated, sensitive, flaky and/or cracked. It effectively soothes, heals and repairs affected areas. It does not leave any oily residue, nor does it dry your skin. Shea butter is suitable for both men and women of all ages. It also makes a great gift. Aya Natural believes that products which are not edible, should not be applied to the skin. Therefore, all their products are made from natural ingredients in which extra virgin olive oil, of an edible grade, is the main ingredient. These products are based on ancient medication and cosmetic recipes passed down through generations and can be traced back hundreds of years. Combined with modern academic studies and scientific research, Aya Natural produces high quality premium products made entirely from plant based ingredients. Sodium olivate, purified aqua, sodium cocoate, sodium palmitate, avocado oil, shea butter, castor oil, jojoba oil, lavender oil and rosemary oil. 100% natural olive oil soap – lavender uses saponified vegetable oils based on Galilean virgin olive oil, supplemented with essential oils. The unique combination of which is rich in vitamins, essential fatty acids, antioxidants and minerals. Whilst keeping the cruelty free PETA seal of approval and being free of any GMO.